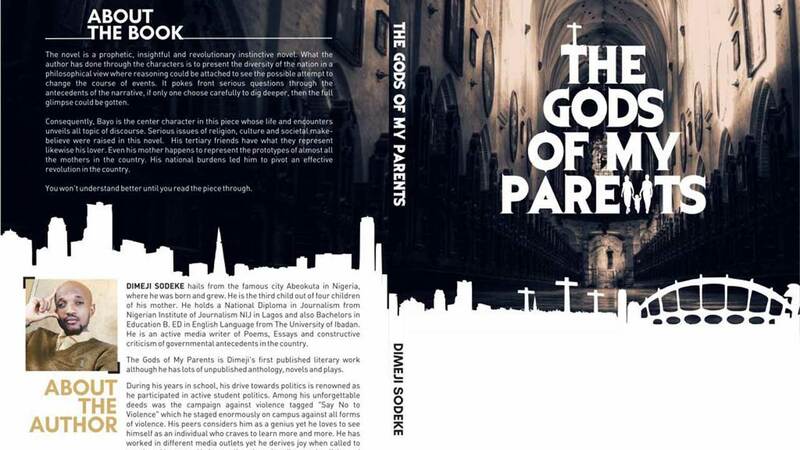 Sodeke Dimeji’s The Gods of my Parents, a novel, is an exposé on Nigeria’s disrupted state of religious, cultural and societal make-believe with viable propositions to achieving the desired change. The author shows his patriotic zeal for the country in five chapters. In weaving through the need for youths to take up leadership mandate, he uses an organised revolutionary system of ‘unity in diversity’. Bayo Ojuoba, the novel’s protagonist, raised by a single mother, cannot recollect his father’s identity, having left for America when the boy was three. While zeroing on Bayo, the novel highlights plight of single mothers, as the protagonist’s mum faces the herculean task of bringing up her son in acceptable manner. As Bayo becomes older, he begins to notice the anomalies in power, law, education and the country’s philosophy, as they only benefit few privileged people in power. Having identified the obvious challenges, Bayo becomes open-minded and resolves to champion a new cause. It is on this path that he meets his love, Nkechi Augustina Offoma, with whom he shares similar ideologies and culture despitecoming from different ethnic groups. Bayo’s mother frowns at the union between Bayo and Nkechi, initially, but fate has a way of bringing them together as a result of the latter’s scary dream. The author in chapter two, titled, My School, takes the reader on a journey to Bayo’s campus experience, where his ability to start a revolutionary movement, Conglomerate of Intelligent Africans (CIA), is shown.My Conglomerate, the third chapter, is a longer narration on CIA’s mission and vision. CIA is a clique of cerebral students, who understand the ugly Nigerian solution and believe that action speaks louder than words. It represents an idea to pursue what is just by a group of students who love to analyse societal issues and discuss them constructively. The idea, which is conceived by the movement, becomes useful for the country. The movement also grows to become societal watchdog and justice restorer of the country. Just like Moses leading the Israelites out of Egyptian captivity, Bayo, fondly called the Black Moses, is determined to infuse black consciousness and give the leadership flag to the selfless, who will unburden the people. In My Fate, the novel’s chapter four, shockingly leads Bayo to his ancestral home where he discovers the dark religious history of his people of Oba. Through a strong self will, he advocates, the God, which his mother has taught him as being more reliable and trustworthy. While emphasising the place of religion in a man’s life, the author stresses love, unity in diversity and revolution as weapons of the warfare for a new Nigeria. He reveals that only collective effort and interest of youths in the polity can bring the desired change.Written in simple language, with few typographical errors, The Gods of My Parents challenges Africans to be less reliant on the West and embrace their own heritage.